I’ve had this painting in my minds eye for a while. It’s a large size oil and it contains subjects and techniques I am not completely familiar with. Because of this the painting has sat there in my mind and grown instead of fading away. It now wants to be a series. But I don’t have the skills yet. I guess it’s time to start researching, sketching and practicing! This is going to be a journey. …And it started at Pinterest. My favorite of the various social media sites. Mostly because it’s made up of pictures and I love pictures! 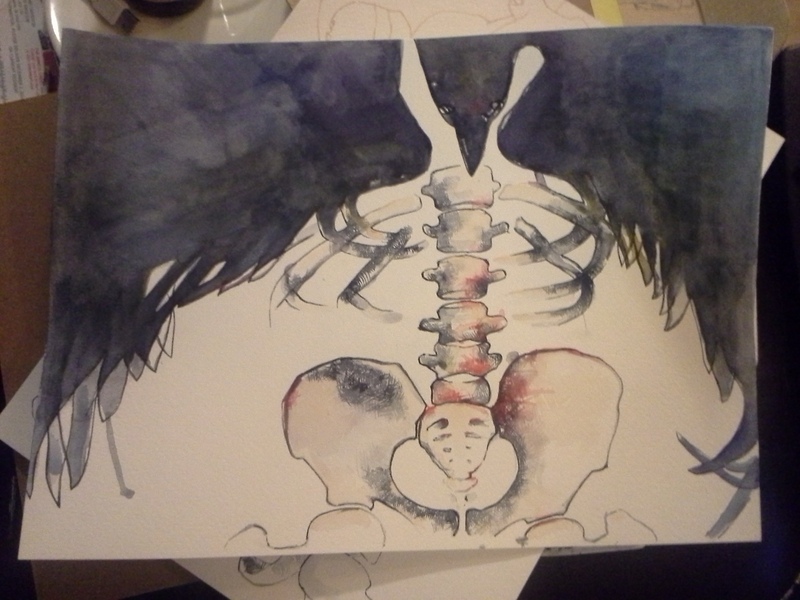 The painting series I envision has skeletal bits, portraits, birds and landscapes. So these are the things I looked for. My next step was to paint! Only one way to learn a painting technique and that’s to do it … and do it… and do it again until it works. I’ve also been creating little stand alone paintings but using the themes I have in mind for the larger oil paintings. While I paint I have many thoughts passing through my brain. On my mind lately are people who are in my life. The kinds of people who are here and the kinds I want to be with me. Sometimes I just feel like I’m being slowly drained and these types of people always seem so nice at first. I feel like they are little birds picking me to the bone. I’m also concentrating a lot on the technical difficulty in the subjects I’ve chosen. 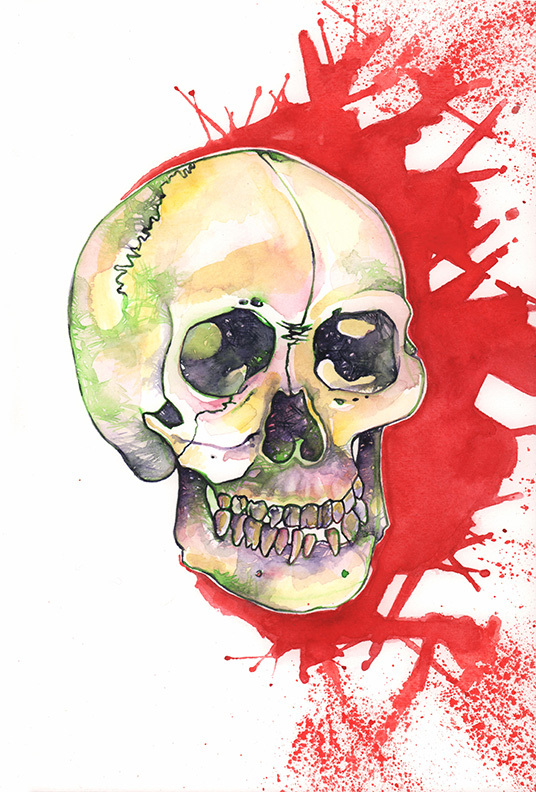 The skull and skeleton is complex but I’m not looking for exact reproduction. Decisions have to be made on what to highlight and what to leave out. Here are some of the small scale stand alone paintings. The two bottom ones are representations of the heart and root chakras. Stay posted for all of the chakra’s represented in drawings. 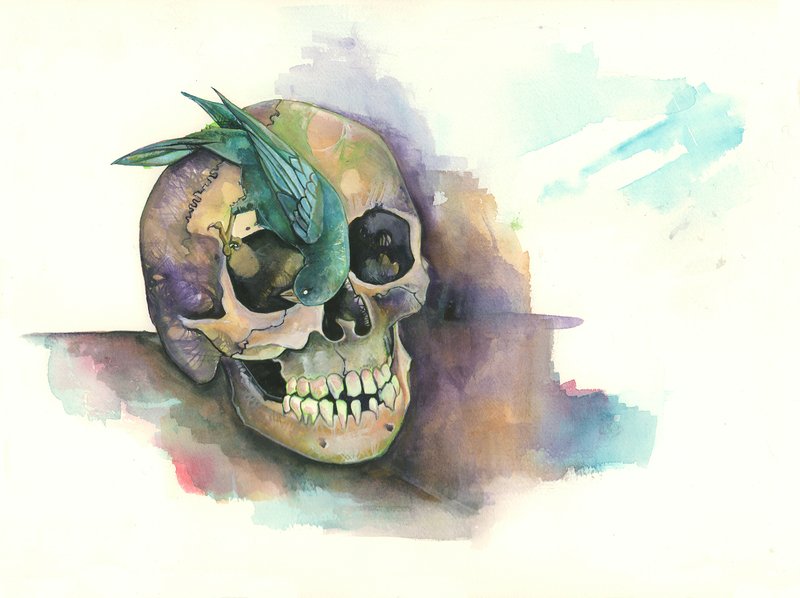 I’m really happy with how the bird and skull painting came out. I call it “Looking for Leftovers” and it as the exact ambiance I’m going for. It really feels like a win! So I’ve done in progress posts before, imperfectly and without much to say about what I was doing. Today I decided I would do better. I would take photos along the way at specific times and I stopped along the way to journal out my thoughts. This small painting is a study for a larger painting and possible series I am going to call picked to the bone. I don’t want to give away too much. Mostly because even I don’t really know whats going to fully happen with this project. However, many studies are going to need to happen to get me where I think I want to be. 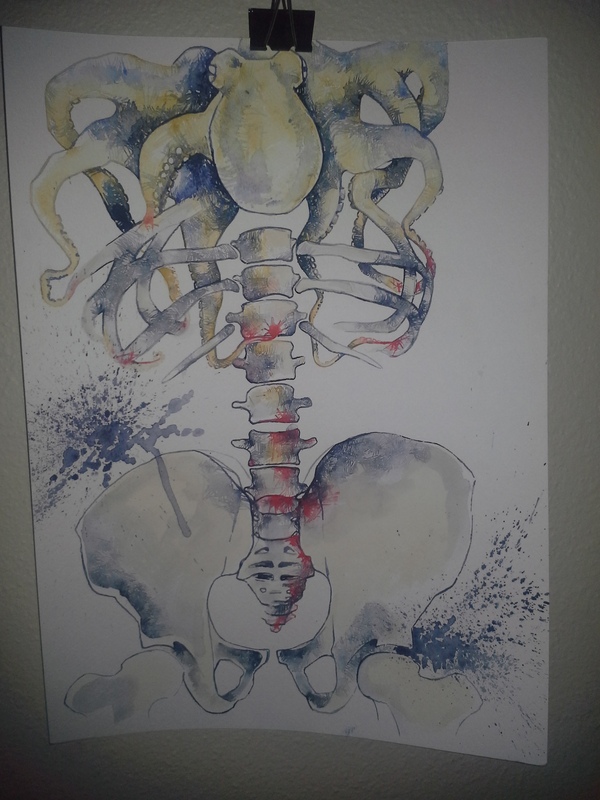 Some will be birds, small animals, landscapes of trees, ponds and hills and most challenging for me, the human skeleton. 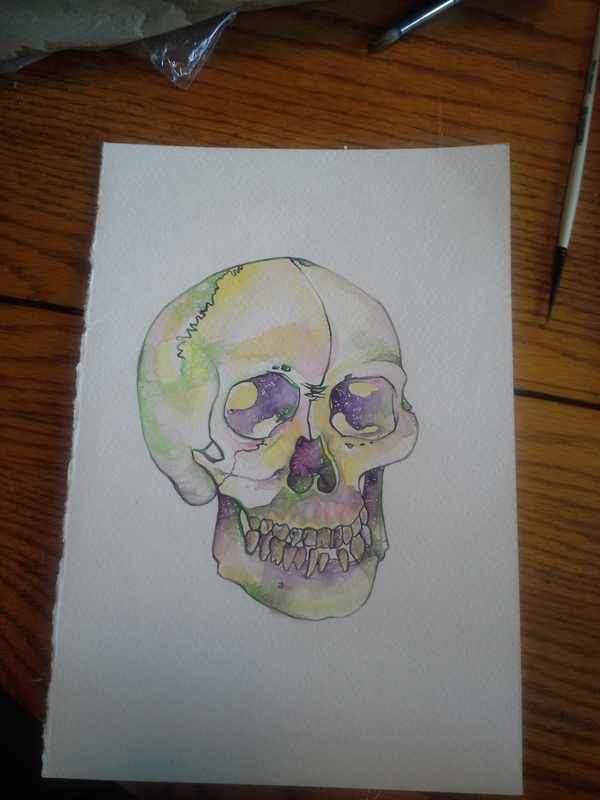 This is a skull. 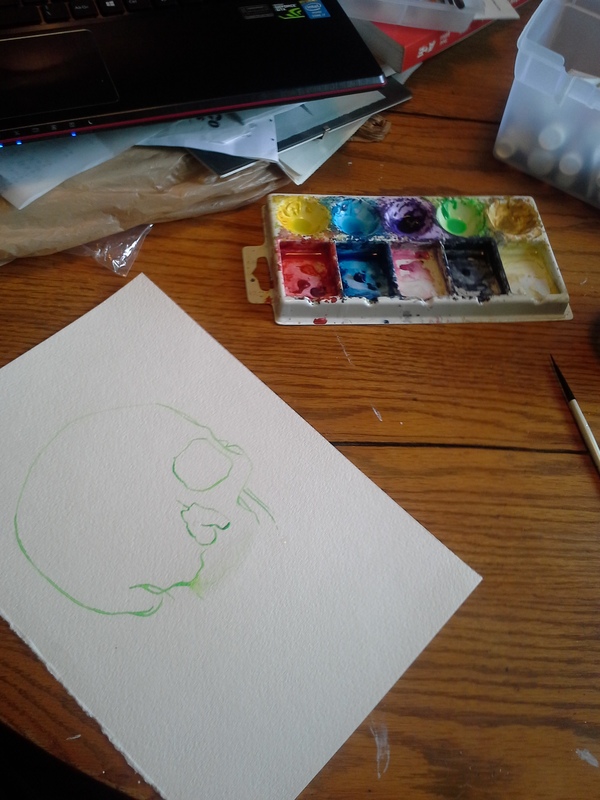 The last time I rendered a human skull was about 15 years ago in my first year of art school. So, I guess its been a while. Here is the beginning! A promising blank sheet of Strathmore 140lb pound watercolor paper that i have torn in half. 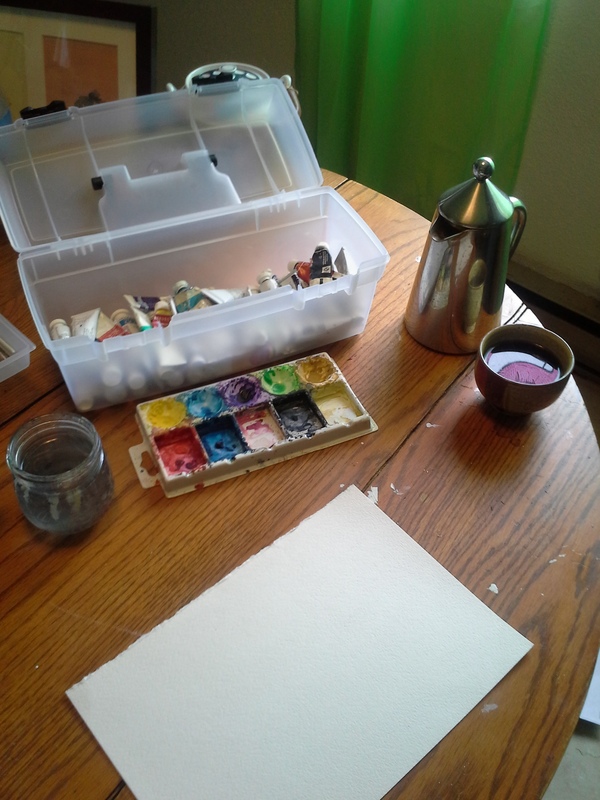 The light coming from the window is perfect for painting today and my coffee is freshly brewed and inviting! I’m just getting started here and already finding all the bumps, divets, cracks and variations of the skull challenging. 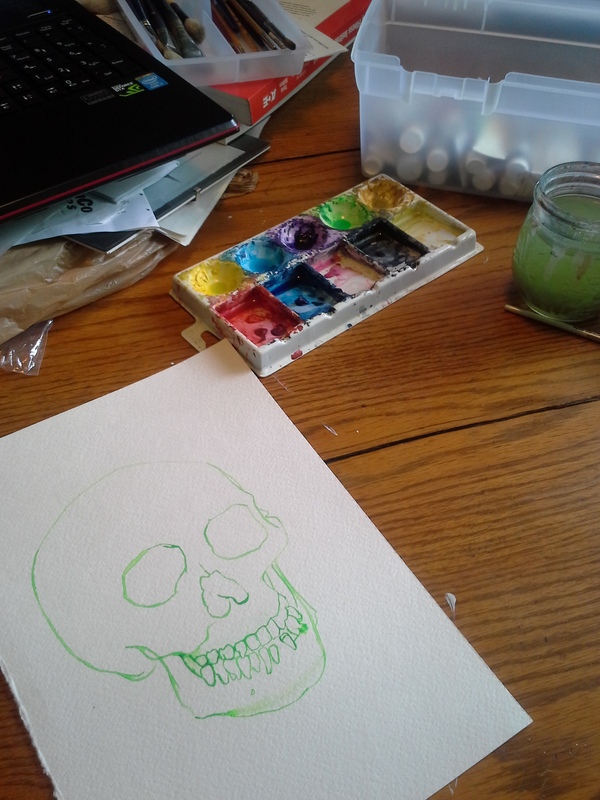 At this point I started to really notice the age of the skull in the photo I was working from. This lead me to think about the person who this skull belonged too. How long ago did they live? Was it a very long time ago? What did they see happen in their lifetime? Or was it not long at all and the process of decomposition just happens faster then anticipated? How did they perish? Gently or violently? And so forth. At this point I have forgotten all about the skull once being alive. It is now only an object. A very intricate and interesting object but lifeless. My thoughts having shifted to understanding this complex object are now transforming it into a painting. I’m thinking about colors, textures and volume and aesthetics. I think I will add a red splat. Here it is completed. All in all I’m pretty happy with the result. 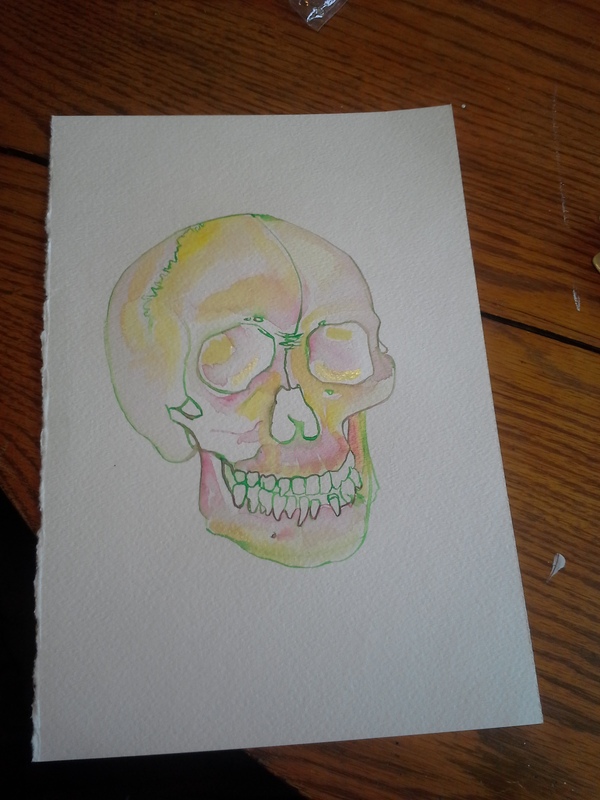 I set out to learn more about the skull and I succeeded at that. That being said there are a few things I’d like to be different so I will probably make at least one more. 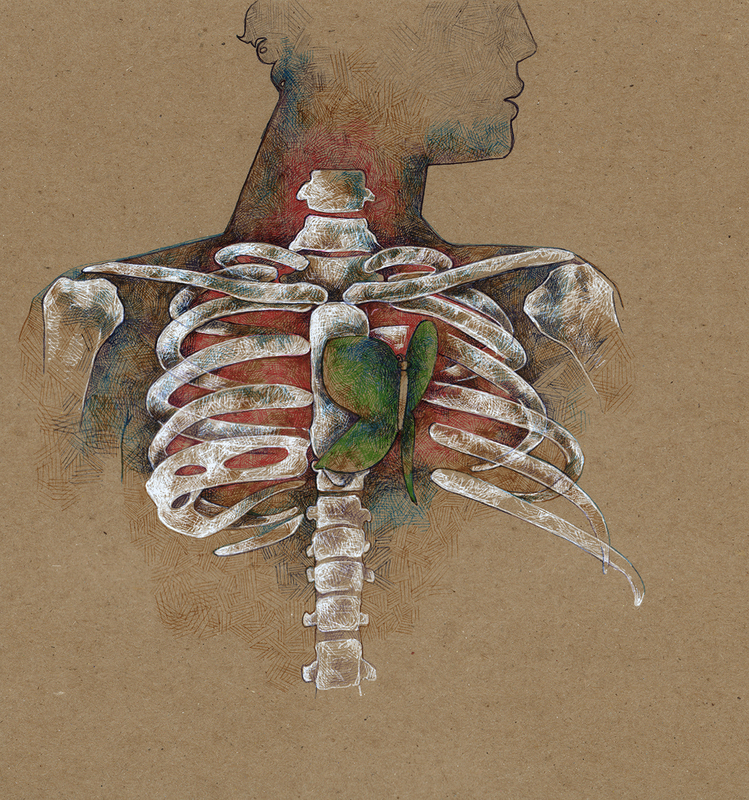 Interested in acquiring some of my art as originals or prints? Check out my Etsy shop or drop me an email. Follow along with my artistic journey by signing up for my newsletter here! Last time I was setting up to work on a drawing I set up the web cam too. I recorded two drawing sessions of about 2 hours each and then compressed the whole thing down to about 9 minutes. You can watch how one of my drawings comes together, getting all the fun parts of watching the art evolve without the boring part of sitting around for hours. 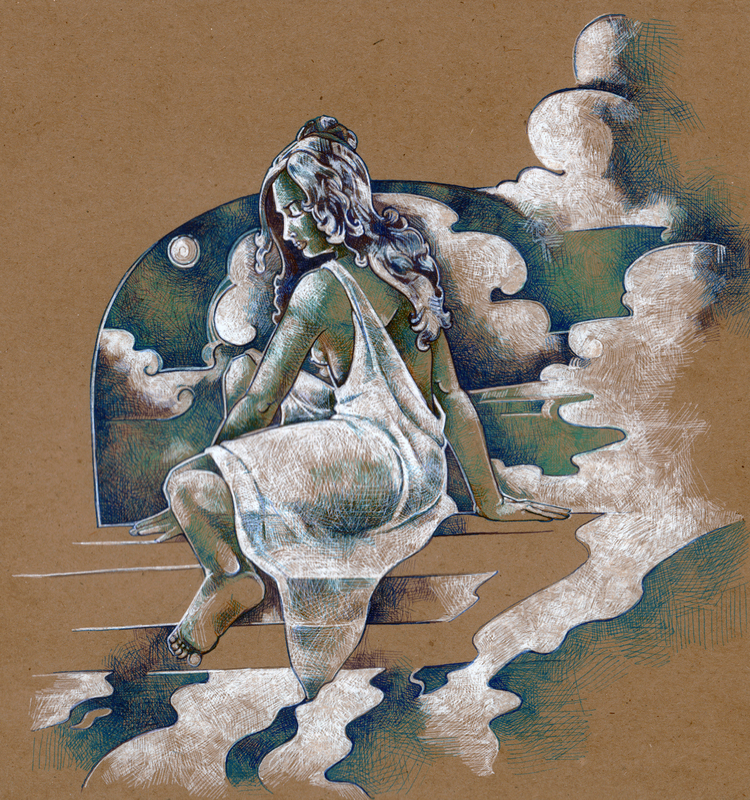 For this video I created the drawing Lady of the Baths. Enjoy. Author krislyndillardPosted on March 9, 2015 Categories art, Art buying, Art collecting, Art community, art in Eugene, Art Inspiration, art printsTags art collecting, art collector, artist, drawing, how to draw, Krislyn Dillard, speed drawingLeave a comment on Watch Me Draw! For about two years now I have been enjoying the use of my Steadler pens on a small square Bee paper drawing pad. They are small enough to take with me everywhere! My studio literally becomes where ever I am. 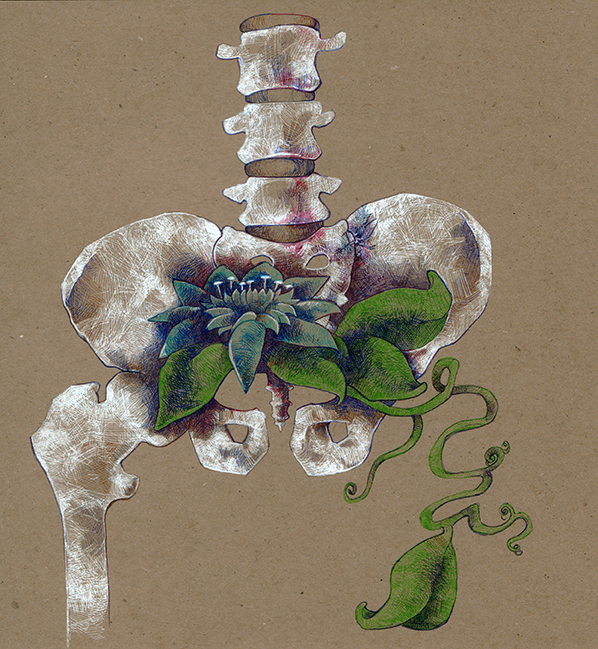 I have used this flexibility of space as a means to bring more flexibility into my drawings. Where once my drawing skills were basically a means to an end to work out ideas for paintings they have now evolved coming into their own. Here are some images of the drawings and some of me in various places creating the drawings. What a ride and its not over yet! 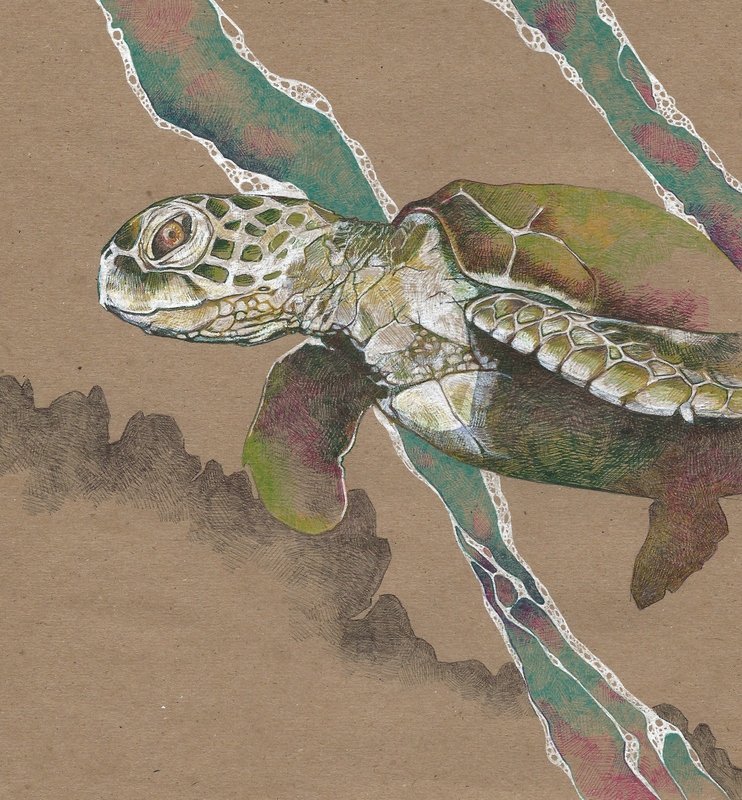 All of these drawings and more to come are in my etsy store Krislyninobscura. I have originals and prints. Check it out! Just a quickie post today. I have had my nose to the grind stone painting up a storm! Here are some snap shots of where I am going. 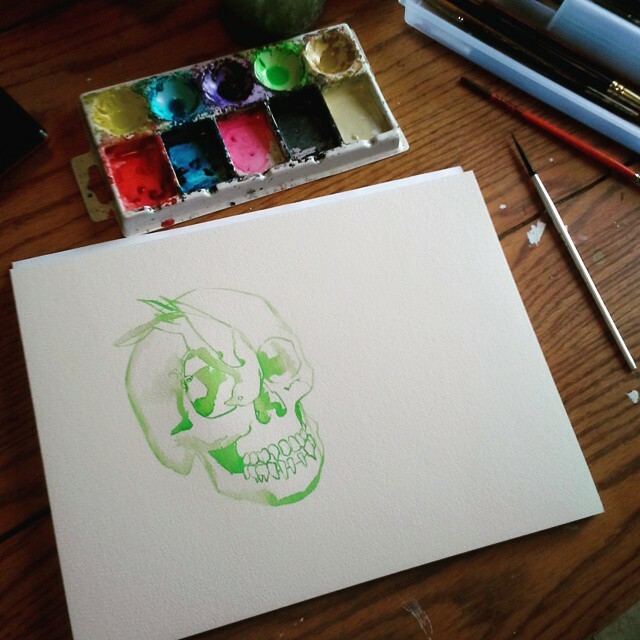 The name “Animal Head” keeps playing in my head as I paint. I’m thinking a series my happen! Enjoy! And keep a look out for more! 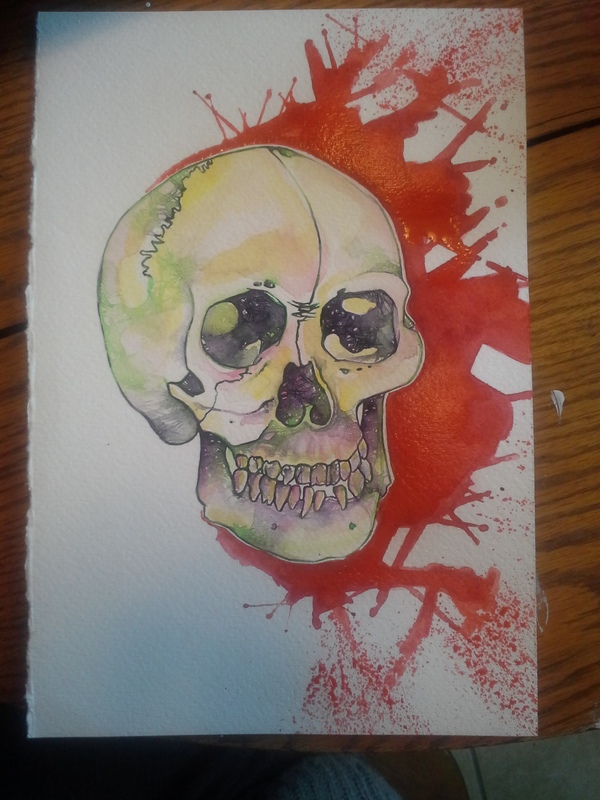 Giving Away Art for the Love of Sharing Art! I came across this little video on the internets about a former Steelers Running Back Baron Bach creating and giving away his art. What really hit me was how much he thought it through before he started. Each piece is unique, beautiful and on a piece of unstretched canvas. It makes me wish I could have been there to get one. Way to go Bach! Enjoy! It’s only 2 minutes long. Author krislyndillardPosted on September 23, 2014 Categories art, Art buying, Art collecting, Art community, artist, footballTags art, art collecting, art collector, art community, art exhibition, artist, Baron Bach, Football, Free art, Pittsburgh, SteelersLeave a comment on Giving Away Art for the Love of Sharing Art! 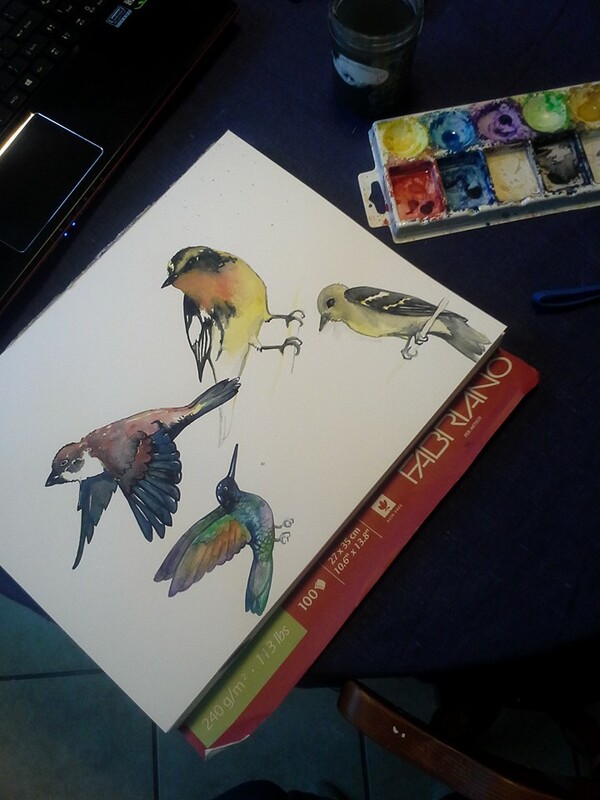 Experimenting with watercolor painting and birds. 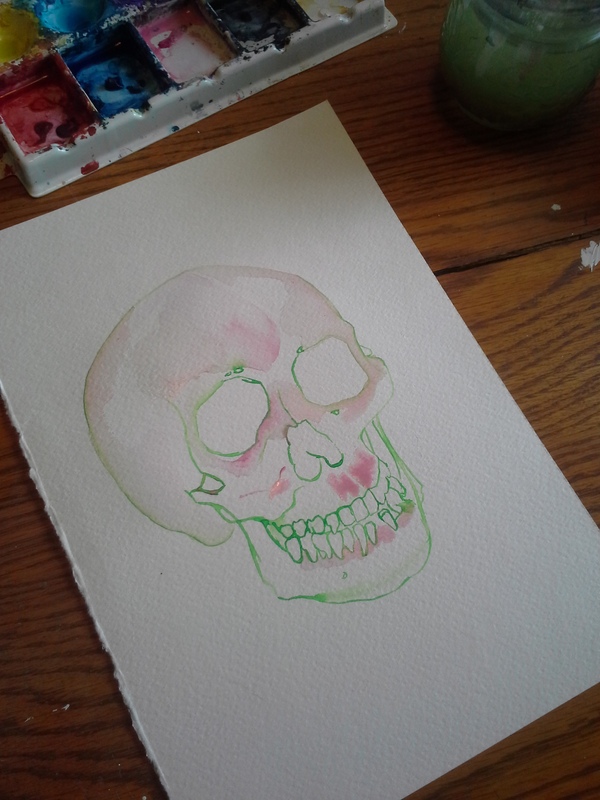 It looks like this is the Summer of watercolor for me! It’s really surprising since I always had a little prejudice against watercolor, imagining ruffly doilies and pink roses and other old lady things (much appologies to ladies who do like those things, its just not my cuppa tea). It turns out there is a lot of interesting layers, textures and fun to be had with negative space! 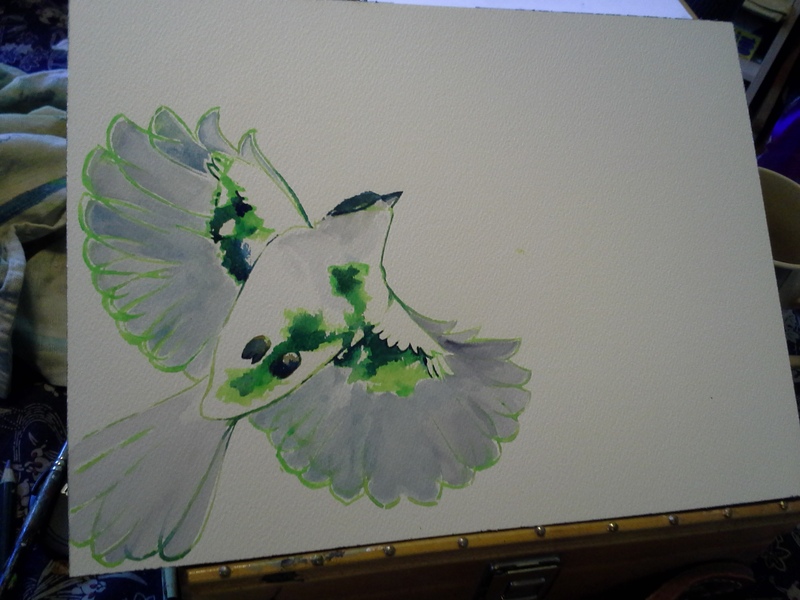 My latest experimentation has been with birds. Krislyn Dillard Create a free website or blog at WordPress.com.